Succotash is a Native American word that means "boiled corn kernels". It's primarily a dish consisting of corn, lima beans or other shell beans. Other ingredients include tomatoes, onions and bell peppers. History tells us that succotash was popular during the Great Depression in the U.S. because it was inexpensive to make. In modern times, all you hear is how corn is bad for you, for the environment, for the animals and it's all GMO (genetically modified organism) This is not true! Not all corn is created equal. There's sweet corn and then there's field corn. The sweet corn is the corn we eat from cans, flash-frozen bags, farmer's markets and our gardens; field corn is the ones used to make high-fructose corn syrup, livestock feed, ethanol and other processed materials. About 90 percent of field corn is genetically modified, but at least 96 percent of sweet corn is not. I learned all of that from Chef Jay Pierce's blog. 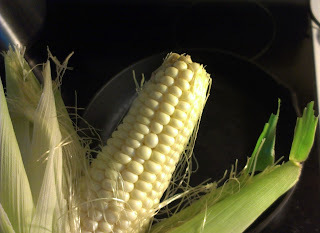 Personally, when I think of corn, I think of succotash. And I always think of succotash as Southern. There may be debates about the topic but succotash is corn prepared with lima beans (or butter beans) and tomatoes are optional. All of this needs to be topped with lard or butter and then it's Southern. Add a cast-iron skillet and you have a recipe for success. Any other variation is merely mixed vegetables. You can add squash, okra, onions, bell peppers, or zucchini but if it doesn't have corn AND butter beans? It's still just mixed vegetables (to me). Succotash is not a catch-all name for vegetable medley. In a large skillet, heat oil and butter over medium-high heat. Add onion; cook until translucent, about 4 minutes. Add lima beans and corn. Season with salt and pepper. Cook, stirring occasionally, until vegetables are tender, about 10 minutes. Season to taste with salt and pepper and serve. I'd love this with some fish. Looks and sounds delicious! Great side. Great side! It goes with everything!